People with cystic fibrosis (CF) experiencing acute pulmonary exacerbations (APE) commonly require intravenous antibiotic therapy (IVAT) and this may be delivered in hospital or in the community. Previous research has produced conflicting evidence when comparing the relative benefits of hospital-based and community-based IVAT in CF. Several studies have demonstrated benefits for hospitalised patients [1-5], but others have found equivalent outcomes for hospital and community treatment [6-10]. Potential reasons that hospitalisation may be more beneficial include closer contact with the CF multi-disciplinary team, improved adherence, the availability of additional intravenous treatments such as aminophylline and the ability to escalate care if clinical status deteriorates. However, there are potential drawbacks of hospital admission, including potential increased cross-infection risks  and disrupted sleep, social and family life . There are also financial implications associated with hospitalisation, with increased costs for the healthcare provider, as well as potential loss of earnings and costs of travel and parking for patients and carers [12,13]. There is a long-established consensus that physical activity is beneficial for CF patients [14-16]. Exercise has been demonstrated to improve ease of expectoration , exercise capacity , quality of life (QoL) , and slow lung function decline  in the stable state. However, there is a lack of research examining the effects of exercise during APE. A recent study, comparing physical activity of patients during hospital admission and one month after hospital discharge, demonstrated reduced physical activity during hospital admission compared to the follow-up period . Bed-rest during APE has previously been suggested to be of benefit  and it is likely that in certain subgroups of patients this is indeed the case. However, there is mounting evidence that where feasible, maintaining physical activity during APE is beneficial. Indeed, Selvadurai et al. found that when standard inpatient care was supplemented with aerobic exercise during APE, children with CF had significantly greater peak aerobic capacity, activity levels and QoL following discharge. In a prospective study, CF patients randomly allocated to receive IVAT in hospital experienced less fatigue than those treated in the community . Additionally ‘general activity was higher in the home group as patients performed routine household and social duties’, reflecting increased activity in community treated patients. However, physical activity was not directly measured in this study and we are not aware of any previous studies comparing the physical activity of CF patients receiving IVAT in hospital and in the community. The purpose of the current study was therefore to compare the physical activity of CF adults receiving IVAT in these two settings, as well as health-related QoL, spirometric and nutritional outcomes. The primary outcome was physical activity as measured by the Actigraph® GT3X activity monitor and we hypothesised that community-treated patients would perform significantly more physical activity than their hospitalised counterparts. West Midlands (Solihull) Research Ethics Committee provided local ethical approval for this non-randomised parallel group prospective observational study (Reference no. 12/WM/0028). Subjects were recruited at West Midlands Adult CF Centre, Birmingham, UK, with the centre caring for approximately 370 CF adults during the study period. Inclusion criteria were: written informed consent, confirmed diagnosis of CF, aged 16 years and over, chronic infection with Pseudomonas aeruginosa, requirement for IVAT for APE as assessed by the direct care team at screening and a plan for patients to receive the entire course of IVAT either in hospital or in the community. Exclusion criteria were: pregnancy, breast feeding, previous lung transplantation, resting transcutaneous oxygen saturations <94%, a plan to change dosage of corticosteroids during the course of antibiotics and if patients were deemed by the treating physician to be too unwell for home IVAT. Location of IVAT was based on a combination of patient and clinician preference and was decided prior to patients being recruited. Subjects receiving community treatment had baseline assessments performed in the clinic area immediately following the decision to start IVAT and follow-up assessments were performed when patients re-attended immediately after completing IVAT. Hospitalised subjects had baseline assessments performed within three days of hospital admission and follow-up assessments performed within the three days prior to completing IVAT. Baseline characteristics were recorded, including: age, gender, lung function (actual and predicted values of FEV1 and FVC), weight, body mass index (BMI), CF-related diabetes status, CF liver disease status, average daily oral corticosteroid dose (if any) and sputum bacteria other than Pseudomonas aeruginosa. At the follow-up visit, lung function, weight, BMI, oral corticosteroid dose, duration and details of IVAT were documented. At baseline and follow–up visits, subjects were asked to complete the Cystic Fibrosis Questionnaire-Revised (CFQ-R), the Habitual Activity Estimation Scale (HAES) and the Modified Shuttle Test (MST). The CFQ-R is a health-related QoL questionnaire validated for use in CF adults . Only the respiratory and digestion domains were extracted, since these domains were felt to be most relevant. The HAES is a patient-reported measure of habitual activity and the MST is an externally paced incremental exercise test, with both being validated in CF [24,25]. Heart rate, oxygen saturations and perceived breathlessness on the modified Borg scale were recorded at the start and end of the MST. The number of 10-metre shuttles completed was also recorded. Subjects were instructed to wear an Actigraph® GT3X activity monitor, a tri-axial accelerometer, for three consecutive days during the first week and three consecutive days during the second week of IVAT. The accelerometer was to be worn around the subjects’ waist during waking hours, except whilst bathing or other direct contact with water. This accelerometer was chosen because a previous version has been validated for use in CF . Analysis of Actigraph® GT3X data from each subject was performed using ActiLife 5 software (ActiGraph® R&D and Software Department, Pensacola, FL), providing six default intensity levels, simplified to four cut points (see Table 1). Subjects did not wear the accelerometer while performing the MST. Subjects were also asked to complete a detailed food diary for three consecutive days during the first week and three consecutive days during the second week of IVAT, with food intake data being analysed using Dietplan6 software (Forestfield Software, UK). Estimated energy intake (from the food diary) minus estimated energy expenditure (from the accelerometer), allowed calculation of estimated energy balance. Hospitalised subjects recruited to the study were not treated any differently to other patients admitted during the same period but not recruited to the study. They were offered regular physiotherapy input and encouraged to use our inpatient gym, based in the CF centre, as usual. Nutritional input was also as standard for other CF inpatients on our ward, with regular dietetic input, three daily meals, additional high-calorie snacks and nutritional supplement drinks. Subjects receiving IVAT in the community were not offered any additional physiotherapy or dietetic input beyond that which was clinically indicated. All statistical testing was two-sided and performed at the 5% significance level using Statistical Package for Social Sciences (SPSS) version 16 software. The Kolmogorov-Smirnov test was used to determine data normality. The majority of results were found to be non-normally distributed therefore descriptive statistics are expressed as median values and Mann Whitney U tests and Spearman’s rho correlations were performed. Descriptive statistics that were normally distributed are expressed as mean values and in the cases of normal distribution, t-tests and Pearson’s correlations were used. Forty-five subjects were recruited between January and October 2012, with 22 subjects in the hospital-treated group and 23 subjects in the community-treated groups. Three hospitalised subjects were recruited to the study, but were subsequently withdrawn from the analysis because they were discharged from hospital during IVAT. Therefore data was analyzed for 19 hospital-treated and 23 community-treated patients. Baseline data (Table 2) shows that subjects within the hospitalised and community cohorts were generally comparable, with the exception of FVC% predicted, which was significantly higher in the community cohort. Table 2 also demonstrates how many subjects participated in each aspect of data collection. All patients received combinations of two or three anti-pseudomonal IV antibiotics. Community-treated patients all received two antibiotics from a combination of tobramycin, meropenem, ceftazidime, colistin, piperacillin/tazobactam or aztreonam. Two hospitalised patients were on three antibiotics, and the rest received two antibiotics from a combination of tobramycin, meropenem, ceftazidime, colistin, piperacillin/tazobactam, aztreonam, fosfomycin, tigecycline or flucloxacillin. Thirteen subjects were taking prednisone: the median daily dose was not significantly different in community-treated and hospitalised patients (13 mg vs 17.5 mg). Ten hospitalised and 17 community subjects wore the accelerometer during the first and second weeks of IVAT, with a further 7 hospitalised and 3 community subjects only wearing the accelerometer for the first week. Accelerometer data demonstrated that subjects in both hospitalised and community cohorts spent the majority of their time in the sedentary activity level during the first week (hospital=87.47%, community=83.95%) with the median percentage of activity falling as the intensity of activity increases (Fig. 1). This pattern is mimicked in the data from the second week, with the median percentage of activity falling as the intensity increases (hospital=76.75%, community=85.48%) (Fig. 1). During the first and second week there was no statistically significant difference between the groups for any of the activity levels. 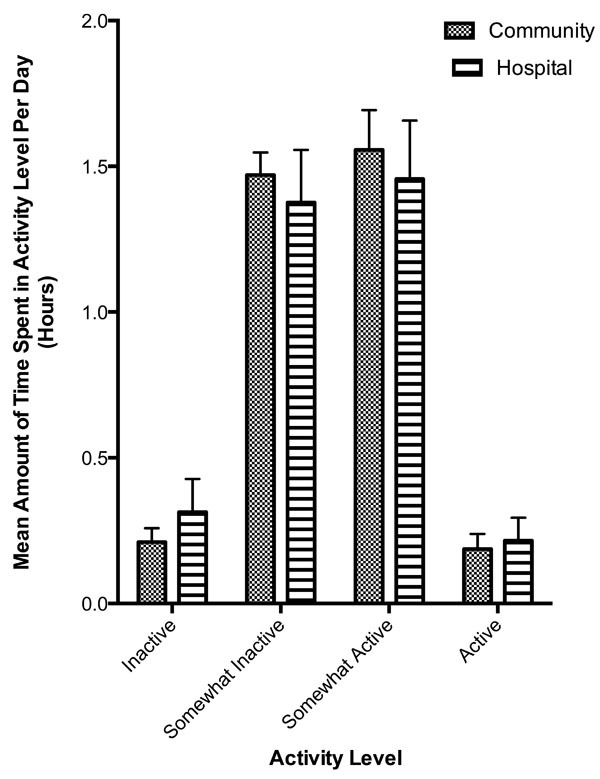 Overall, males did significantly more vigorous exercise than females (p=0.024). Activity monitor-measured physical activity levels in community and hospital-treated patients. 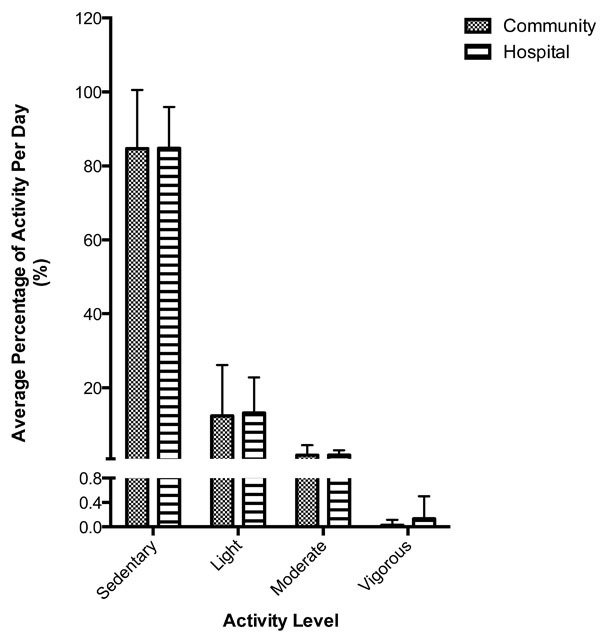 HAES-measured physical activity levels in community and hospital-treated patients. 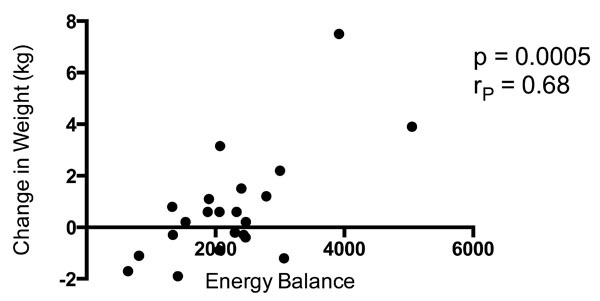 Correlation between estimated energy balance and weight change in all study participants combined. Nine subjects in the hospital group and 18 subjects in the community group completed the HAES questionnaire at the beginning and end of IVAT. Both cohorts reported spending their time predominantly in the somewhat inactive (SI) and somewhat active (SA) activity levels (Fig. 2). As with the results from the accelerometer, there was no statistically significant difference between the groups. For the questionnaire completed at the end of IVAT, males spent significantly more time in the SI activity level than females (p=0.023). Six hospitalised subjects and 11 community-treated subjects completed the MST at the start and end of IVAT, with number of shuttles completed significantly increasing in both cohorts. There was no statistically significant difference between the hospitalised cohort (68 shuttles pre-IVAT vs 84.3 shuttles post-IVAT) and the community cohort (57.4 shuttles pre-IVAT vs 67.5 shuttles post-IVAT). There was no correlation between change in MST and lung function. There was also no correlation between change in MST and percentage of sedentary activity on the accelerometer. Males performed more shuttles than females overall (p=0.022) when the MST results from the beginning and end of IVAT were combined. There were no significant differences in estimated energy intake, expenditure or balance between hospitalised and community-treated cohorts, either in the first or second week of IVAT (Table 3). Cut off points used to categorise activity monitormeasured physical activity levels. Estimated energy intake, expenditure and balance derived from analysis of food diary and activity monitor data. Body weight and spirometry before and after IV antibiotic treatment in community and hospital-treated subjects. During the first week of IVAT, males had greater energy intake than females (p=0.034), however overall there was no difference between the genders. Body weight of hospitalised subjects increased significantly during IVAT, but no such difference was seen in community-treated subjects (Table 4). Fig. (3) demonstrates the correlation between weight change and energy balance in both cohorts combined (RP 0.68, p=0.0005). FEV1% predicted and FVC% predicted increased significantly in community-treated subjects during IVAT (Table 4). Although FVC% predicted increased significantly in hospitalised subjects, this cohort showed only a non-significant increase in FEV1% predicted comparing values before and after IVAT (Table 4). Nine hospitalised subjects and 13 community-treated subjects completed the CFQ-R at the beginning and end of IVAT. The digestion domain did not change significantly over the course of IVAT (p=0.727), with no significant difference between hospitalised and community-treated subjects. The respiratory domain did improve significantly over the course of IVAT (p=0.004), with a significantly greater improvement for community-treated subjects (p=0.02). Questions that showed particular discrepancies between hospitalised and community-treated subjects included “have you had trouble breathing?” and “have you woken up during the night because you were coughing?” There was no significant correlation between the change in CFQ-R respiratory domain scores and change in FEV1 (Rs 0.185, p=0.634). This is the first study to compare physical activity in CF patients receiving IVAT in hospital and in the community, finding no significant difference in directly measured between the two cohorts. Self-reported physical activity, measured by the HAES, also showed no difference between the cohorts. Subjects in both cohorts spent the majority of their time sedentary during the treatment period, with no increase in activity comparing the beginning and end of IVAT. Body weight increased significantly in hospitalised subjects, whereas no significant increase was seen in community treated subjects. CF patients receiving IVAT in the community were previously assumed to be more active than their hospitalised counterparts, since they are theoretically better able to continue with their routine daily activities . However, this has not previously been directly measured and we have relied on patient testimony as to the perceived benefits of community-delivered treatment. We are aware from previous studies that patients often over-estimate their levels of physical activity and that is confirmed in the current study. Despite most participants self-reporting their activity levels as being ‘somewhat active’ or ‘somewhat inactive’, accelerometer data demonstrated that the vast majority were in fact sedentary. In some ways the observed low levels of physical activity is unsurprising, since patients experiencing an APE are less likely to feel well enough to exercise and to take part in routine daily activities. The additional burden of IVAT, with most community-treated patients being required to draw up and administer their own antibiotics on four or five separate occasions every day, is likely to further limit the opportunity for physical activity. Hospitalised patients, in contrast, usually have IVAT prepared and administered by nursing staff, which potentially affords patients extra ‘free time’ in which to remain physically active. Patients admitted to our centre are encouraged to exercise on a daily basis and have exclusive access to a well-equipped gymnasium located within our inpatient ward. Since hospitalised subjects were encouraged to exercise and were free of the distractions of work and education, this may theoretically have allowed them to focus more on remaining active. It has previously been demonstrated that hospitalised CF patients have better nutritional outcomes than community-treated patients  and a potential explanation for this observation is reduced activity in hospitalised patients. The current study also demonstrates that hospitalised patients had better weight gain than community-treated patients, but this was not associated with differences in directly observed or self-reported physical activity levels. Another potential factor explaining the observed better nutritional outcomes in hospitalised patients is a more intensive focus on optimising dietary intake. Indeed, as is the case in the majority of CF centres, a dietician sees every patient admitted to our centre at regular intervals during their admission, ensuring that patients are offered specialist dietary advice. In addition, patients admitted to our centre are able to order specially prepared high-calorie meals and snacks in addition to the standard hospital food served to non-CF patients in other wards. However, we observed no significant difference in energy intake or energy balance when comparing hospitalised and community-treated subjects. Superior nutritional outcomes in hospitalised patients could also theoretically be due to more intensive antibiotic treatment or use of systemic corticosteroids, but again we saw no significant differences in the use of these treatments between the cohorts. Since changes in body weight often reflect changes in spirometry in people with CF, another potential reason for improved nutritional outcomes in hospitalised patients could be improved pulmonary function. Although absolute values of FEV1% predicted and FVC% predicted increased in both hospitalised and community-treated patients, the increase in FEV1% predicted did not increase significantly in hospitalised patients. This study therefore does not provide a clear explanation for the better nutritional outcomes observed in the hospitalised cohort. Wells et al. compared self-reported and directly measured physical activity in CF adolescents in the stable state, using the HAES questionnaire and a similar accelerometer to that used in the current study. They demonstrated a highly significant positive correlation between the results generated by these two methods (p<0.0001). The findings of the current study provide further evidence of the validity of the HAES questionnaire. As was reported by Wells et al., patients reported higher levels of activity than were directly recorded by the accelerometer. This discrepancy was more marked in the current study, which is likely due to the differences in clinical status, since we studied patients experiencing an APE and Wells et al. studied patients in the stable state. Community-treated subjects in the current study had a significantly greater increase in the respiratory domain of the CFQ-R than the hospitalised subjects. We found this interesting since it was contrary to what would be expected from previous research suggesting that community-treated patients experience higher levels of fatigue due to being more dyspnoeic . A potential explanation for our finding is that since community-treated subjects were in their normal home environment, they may have been comparing their respiratory symptoms to their baseline stable state. Hospital-treated subjects were potentially more aware of their clinical status due to their hospital surroundings, which may have reduced expectations of their respiratory symptoms. We acknowledge several limitations of the current study. Only 10 of the 19 hospitalised subjects wore the accelerometer during both the first and second week of IVAT. Although a further seven hospitalised patients wore the accelerometer solely during the first week, this limits the reliability our findings. The most frequent reason cited for failing to wear the monitor as per protocol was that patients simply forgot, although it is certainly feasible that the more unwell patients were more likely to fail to wear the monitor. Several community-treated patients also failed to complete the MST at the end of IVAT despite undertaking it at the start. This was usually due to a lack of time, or feeling too unwell. The latter could potentially bias the results if patients who showed the most clinical improvement tended to complete the test. In addition, since we excluded patients that were more significantly unwell, our findings are not applicable to all CF adults requiring IVAT. The inclusion criteria were used in an effort to make the baseline characteristics of both cohorts comparable, but they could have selected patients that were more active in the hospitalised cohort and this could explain the lack of difference in physical activity between the cohorts. In summary, this study demonstrates that hospitalised and community-treated CF adults receiving IVAT for APE are generally sedentary, with no significant difference in physical activity between the two groups. The relatively low intensity of physical activity in both hospitalised and community-treated patients suggests the need to further promote physical activity in suitable patients during APE where considered appropriate. Our findings demonstrate the need for further research examining physical activity levels in CF patients experiencing APE, as well as the potential benefits of exercise programmes for both hospitalised and community-treated patients. E. Nash conceived of and designed the study; H. Khiroya, R. Pound, U. Qureshi, R. Rashid, J. Whitehouse, E. Nash recruited patients; H. Khiroya, U. Qureshi, R. Pound analysed the data; all authors were involved in revising and approving the manuscript. We would like to thank the patients, dieticians and physiotherapists that made this study possible. West Midlands (Solihull) Research Ethics Committee provided local ethical approval for this study (Reference no. 12/WM/0028) and all subjects gave informed consent prior to their inclusion in the study. Thornton J, Elliott R, Tully MP, Dodd M, Webb AK. Long term clinical outcome of home and hospital intravenous antibiotic treatment in adults with cystic fibrosis. Thorax 2004; 59(3): 242-6. Nazer D, Abdulhamid I, Thomas R, Pendleton S. Home versus hospital intravenous antibiotic therapy for acute pulmonary exacerbations in children with cystic fibrosis. Pediatr Pulmonol 2006; 41(8): 744-9. Esmond G, Butler M, McCormack AM. Comparison of hospital and home intravenous antibiotic therapy in adults with cystic fibrosis. J Clin Nurs 2006; 15(1): 52-60. Termoz A, Touzet S, Bourdy S , et al. Effectiveness of home treatment for patients with cystic fibrosis the intravenous administration of antibiotics to treat respiratory infections. Pediatr Pulmonol 2008; 43(9): 908-15. Lavie M, Vilozni D, Sokol G, Somech R, Szeinberg A, Efrati O. Hospital versus home treatment of respiratory exacerbations in cystic fibrosis. Med Sci Monit 2011; 17(12): CR698-703. Gilbert J, Robinson T, Littlewood JM. Home intravenous antibiotic treatment in cystic fibrosis. Arch Dis Child 1988; 63(5): 512-7. Pond MN, Newport M, Joanes D, Conway SP. Home versus hospital intravenous antibiotic therapy in the treatment of young adults with cystic fibrosis. Eur Respir J 1994; 7(9): 1640-4. Riethmueller J, Busch A, Damm V, Ziebach R, Stern M. Home and hospital antibiotic treatment prove similarly effective in cystic fibrosis. Infection 2002; 30(6): 387-91. Wolter JM, Cagney RA, McCormack JG. A randomized trial of home vs hospital intravenous antibiotic therapy in adults with infectious diseases. J Infect 2004; 48(3): 263-8. Collaco JM, Green DM, Cutting GR, Naughton KM, Mogayzel PJ Jr. Location and duration of treatment of cystic fibrosis respiratory exacerbations do not affect outcomes. Am J Respir Crit Care Med 2010; 182(9): 1137-43. Holmes A, Nolan R, Taylor R , et al. An epidemic of burkholderia cepacia transmitted between patients with and without cystic fibrosis. J Infect Dis 1999; 179(5): 1197-205. Wolter JM, Bowler SD, Nolan PJ, McCormack JG. Home intravenous therapy in cystic fibrosis a prospective randomized trial examining clinical, quality of life and cost aspects. Eur Respir J 1997; 10(4): 896-900. Thornton J, Elliott RA, Tully MP, Dodd M, Webb AK. Clinical and economic choices in the treatment of respiratory infections in cystic fibrosis comparing hospital and home care. J Cyst Fibros 2005; 4(4): 239-47. Yankaskas Jr, Marshall BC, Sufian B, Simon RH, Rodman D. Cystic fibrosis adult care*. Chest 2004; 125(1)(Suppl ): 1S-39. Kerem E, Conway S, Elborn S, Heijerman H. Standards of care for patients with cystic fibrosis a European consensus. J Cyst Fibros 2005; 4(1): 7-26. Dwyer TJ, Alison JA, McKeough ZJ, Daviskas E, Bye PT. Effects of exercise on respiratory flow and sputum properties in patients with cystic fibrosis. Chest 2011; 139(4): 870-7. Hebestreit H, Kieser S, Junge S , et al. Long-term effects of a partially supervised conditioning programme in cystic fibrosis. Eur Respir J 2010; 35: 578-83. Moorcroft AJ, Dodd ME, Morris J, Webb AK. Individualised unsupervised exercise training in adults with cystic fibrosis a 1 year randomised controlled trial. Thorax 2004; 59(12): 1074-80. Ward N, White D, Rowe H, Stiller K, Sullivan T. Physical activity levels of patients with cystic fibrosis hospitalised with an acute respiratory exacerbation. Respir Med 2013; 107(7): 1014-20. Sequeiros IM, Jarad NA. Home intravenous antibiotic treatment for acute pulmonary exacerbations in cystic fibrosis - Is it good for the patientκ. Ann Thorac Med 2009; 4(3): 111-4. Selvadurai HC, Blimkie CJ, Meyers N, Mellis CM, Cooper PJ, Van Asperen PP. Randomized controlled study of in-hospital exercise training programs in children with cystic fibrosis. Pediatric Pulmonology 2002; 33(3): 194-200. Quittner AL, Modi AC, Wainwright C, Otto K, Kirihara J, Montgomery AB. Determination of the minimal clinically important difference scores for the Cystic Fibrosis Questionnaire-Revised respiratory symptom scale in two populations of patients with cystic fibrosis and chronic Pseudomonas aeruginosa airway infection. Chest 2009; 135(6): 1610-8. Wells GD, Wilkes DL, Schneiderman-Walker J , et al. Reliability and validity of the habitual activity estimation scale (HAES) in patients with cystic fibrosis. Pediatr Pulmonol 2008; 43(4): 345-53. Bradley J, Howard J, Wallace E, Elborn S. Validity of a modified shuttle test in adult cystic fibrosis. Thorax 1999; 54(5): 437-39. Ruf KC, Fehn S, Bachmann M , et al. Validation of activity questionnaires in patients with cystic fibrosis by accelerometry and cycle ergometry. BMC Med Res Methodol 2012; 12: 4.